And we’re back. 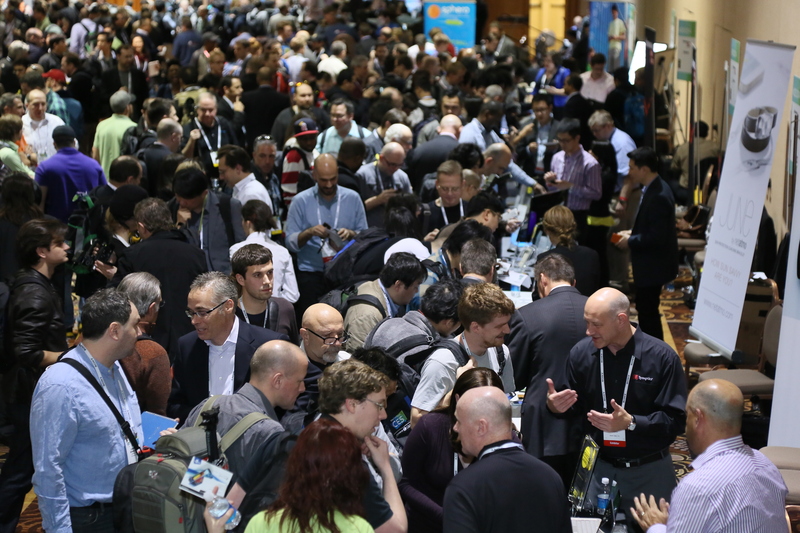 CES was larger than ever: 3200 exhibitors and over 150,000 attendees. With 30 customer meetings in our meeting room in 4 days, we didn’t see much of the show floor though. Instead, we concentrated on our customers, discussing our computer vision acceleration solution, running algorithms such as face detection, feature detection, and optical flow, key algorithms for applications such as gesture recognition, automotive driver assist systems, and augmented reality. With respect to video coding, we showed them our FHD H.264 High Intra, DRAM-less, low-delay, 10/12-bit encode/decode as well as our multi-format FHD video encode/decode IP. The demonstrations showed how we integrate with an ARM host CPU, Linux, Android, cameras, and displays, and we even hooked up our development board to an off-the-shelf tablet, accelerating the host CPU 100x and lowering the power consumption by a factor of 1000. 1. 3D Printing: This new TechZone showcased the latest in 3D printing making it more accessible for today’s consumers. 2. Driverless Cars: This technology was featured in a new TechZone called the Driverless Car Experience, sponsored by Bosch. They featured technologies that support the future of autonomous/ automated driving by several manufacturers. 3. Health Technology: Billions of dollars will be spent on digital health over the next few decades by tech-enabled adults and medical institutions. Innovations in digital health outpace all other areas of tech innovation. 4. Sensor Technologies: The MotionTech TechZone showcased some of the leading innovations in the progressive field of sensor technology. 5. Ultra HD TV: The next generation of high-definition display technology is the closest thing to bringing the 4K Digital Cinema theatrical experience to the home. Hisense, LG, Panasonic, Sharp, Sony and Toshiba showed their products. 6. Wearable Technology: FashionWare was a new lifestyle TechZone showcasing wearable tech, from jackets that adjust based on outside temperature to solar-charging handbags. The new Wrist Revolution TechZone will showed how the standard wristwatch can add GPS, a music player, a health monitor and other functions. The interesting thing is that the videantis video and image processing solutions address all of these applications. For 3D printing, you need a 3D model, which can be acquired with a depth sensor, which requires heavy duty image processing. Driverless cars heavily lean on video capture and computer vision. Health technology is quite varied, but your mobile phone’s camera can play a major role in judging how you’re doing. See for instance Ramesh Raskar’s TEDMED 2013 talk, where he shows how images of the retina can make predictions about overall health. Sensor technologies are rapidly growing, and image sensors all require video processing. Ultra HD TVs typically use new compression algorithms such as HEVC or VP9, which we can run on our video processor also. And wearable cameras such as the GoPro will shrink further, and will become more autonomous, deciding when and where to take and store pictures. Again, this requires a flexible video-processing platform, one that videantis can provide. Thank you all for meeting with us. For those that we didn’t get to meet, there’s always the Mobile World Congress at the end of February in Barcelona, our next major event, or send us an email.